Railings are extremely important for the safety of those on, under, and around a deck area. The IRC, or International Residential Code, and the IBC, or International Building Code regulate the railing specifications. Deck railings have strict building codes. 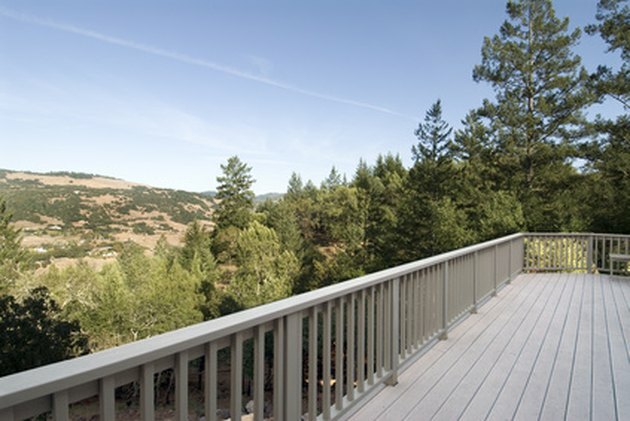 Railings for residential decks require a height of 3 feet from the floor of the deck to the rail top surface, as mandated by the IRC. Commercial railings necessitate a higher railing at 42 inches, as regulated by the IBC. Another specification for railings include rail spacing that is less than 4 inches apart, making sure that a ball or sphere of 4 inches in diameter cannot push in between for safety parameters. Any deck that is 30 inches or more above ground must have a railing, as well as a building permit for that deck, if it is an addition to a building. If a deck is below 30 inches, it is the owner's choice to install railings, though they still must adhere to the mandated rules. What Is the Height of a Stair Banister?